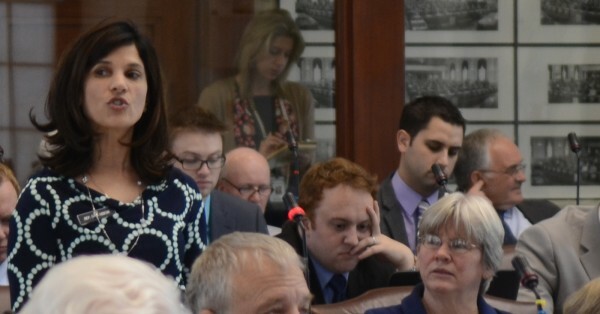 In this April 2014 file photo, Rep. Sara Gideon, D-Freeport, speaks about her bill to expand the availability of Narcan, a drug that can reverse a heroin overdose, during a floor speech in the House of Representatives. AUGUSTA, Maine — Gov. Paul LePage has allowed into law a bill expanding access to a drug that can stop a heroin overdose in its tracks, buying a drug user more time to receive potentially life-saving medical care. LePage, who had originally opposed the measure, allowed the bill to become law without his signature. The measure, sponsored by Rep. Sara Gideon, D-Freeport, received broad bipartisan support in the Legislature. Because the bill was an emergency measure, the new law takes effect immediately. Hospitals have had access to the drug — naloxone hydrochloride, better known by its brand name, Narcan — for decades. The new law allows the drug to be administered by a broader swath of first responders, including law enforcement officers, firefighters and basic-level emergency medical service providers. The law requires any police or fire department that chooses to begin a Narcan program to receive medical training as determined by the state Medical Direction and Practices Board, which is required to establish a training regime for any interested agency. It is unclear how soon the board will establish the training program, and efforts Tuesday to contact the board were unsuccessful. The law also allows family members of any individual at risk of an opiate overdose to be prescribed the drug and to administer it to the relative in the event of an overdose. It is unclear just how many new uniformed responders will end up routinely carrying the drug, but not every police department is eager to start a Narcan program. Lt. Harold Page, acting chief of the Ellsworth Police Department, said there are still more questions he needs answered before making a decision. Page said that even if all the logistics pan out, Ellsworth’s police still may not carry the drug. Most of the times an overdose occurs, he said, the ambulance is called before the police. He said, for that reason, it makes more sense for emergency medical responders to carry the drug than police officers. Paramedics and other emergency medical responders with high levels of training already are authorized to administer Narcan, but basic-level EMTs are not — and not every ambulance call is answered by a paramedic. Lt. Robert Savary of the Bath Police Department gave a similar response: “Our view is that since we are in a community with rescue so close, we’re probably going to let them provide Narcan on scene,” Savary said Tuesday. Police Chief Edward Googins in South Portland shared a similar sentiment and said his city had an ambulance corps that saw paramedics take part in every single ride. That means there’s already someone on hand to administer Narcan when an overdose is reported. It’s a good thing, too, he said, South Portland regularly makes use of the overdose antidote. An earlier version of Gideon’s bill would have expanded access to all EMS responders, but that provision was gutted after the governor indicated he would oppose it. The decision on whether to expand authorization to all medical responders lies with the state board that oversees emergency medical services. In Maine, heroin use and overdoses are on the rise, a spike that law-enforcement officials link, in part, to successful efforts to prevent prescription opiates such as oxycodone from entering the black market. In 2012, fatal heroin overdoses quadrupled over the previous year, from seven deaths to 28. The attorney general’s office says that number is likely to grow again when 2013 data is compiled.